Curry is a meal that can seem daunting to make, but I assure you it’s actually much easier than you think! 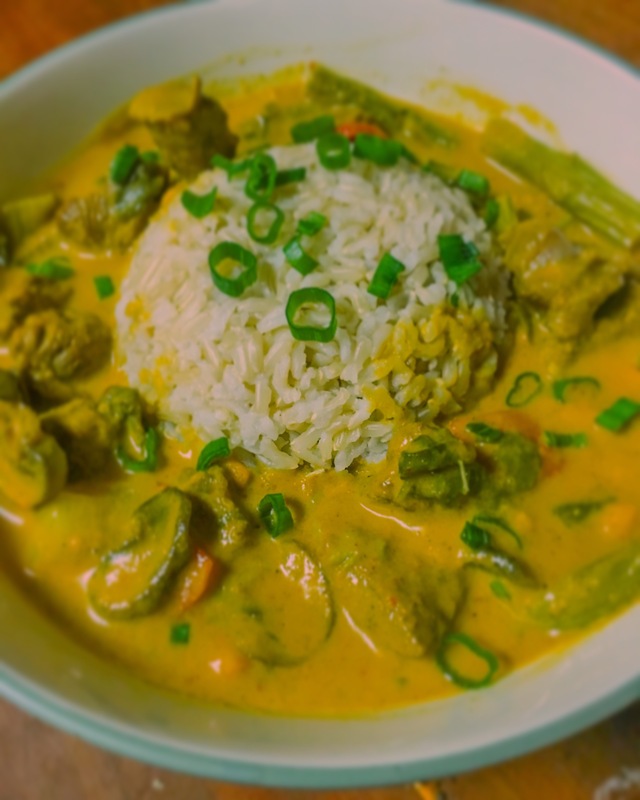 I started cooking curry about 5 years ago, my best friend & I were poor college kids & couldn’t afford to order in delicious Thai as much as we’d like, so we decided to combine our culinary skills & make our own curry. Since then, curry has become a staple meal in our house. I love making curry because there can be a ton of variations, you can change up the protein or veggies for a different taste. In the autumn & winter months I love making curry with pumpkin or squash. One of the reasons curry makes it on our menu so frequently is beacuse it’s a relatively quick meal that usually is filled with veggies & protein & typically renders lots of leftovers! So this is often one of the “big batches” I make early in the week. The first step is to cut the protein into small bite size pieces & season with: salt, pepper, garlic powder, curry powder & turmeric. Once seasoned I place in the fridge while the rest of the prep work is done. The next step is to prep all the vegetables. I usually use mushrooms, sweet potatoes, bok-choy, bell peppers. I typically just use whatever’s in the veggie drawer. I truly believe that eating healthy involves eating colorfully so I’m all for any meal that incorporates a ton of veggies. Once all the veggies have been prepped, heat 2 tsp of olive oil in large saucepan or skillet over medium heat. Add in onions, garlic & seasoned meat. You want to saute the meat until it starts to brown, (timing will vary depending on protein type). Next, add in the chopped sweet potatoes and allow to cook for 3-5 minutes, covered. The sweet potatoes & rest of the veggies will continue to cook once the coconut milk is added so don’t worry if you think the veggies are too underdone. Uncover the meat & potatoes, add bell pepper & allow to saute uncovered for 3-5 minutes. Next add in the more delicate vegetables, like mushrooms and bok choy. Put curry paste & additional curry powder to taste. I usually add 2-3 tbsp of paste & an additional 1 tspb of curry powder. Allow the vegetables & seasonings to cook uncovered for approx 4 minutes. Finally, add in two cans of coconut milk and bring to low boil. Making sure all the curry paste has dissolved. Adjust for taste, adding more paste or powder as needed. Allow to cook at a low simmer for approx 10 minutes. Serve hot over rice. If you try to recreate this recipe I’d love to hear about it in the comments below! 1 package of stew meat or protein of choice. Sliced protein to desired bite size pieces, I find the stew meat often needs to be cut into smaller pieces & usually trimmed of some fat. Season meat with: salt, pepper, curry powder (2 tsp), garlic powder & a few dashes of turmeric. Place meat in fridge to marinate. While the meat marinates, chop all the veggies & set aside. In a large skillet or large pan, over medium high heat begin sauteing onions, garlic and meat. Once meat begins to brown add in sweet potato. I try to add the vegetables in order of which takes the longest to cook. Once the sweet potatoes have been sauteing for 3-4 minutes along with the meat, add in bell peppers and allow to cook for additional 3-4 minutes, stirring occasionally. Once the vegetables have started to cook, add in the curry paste, curry powder & turmeric, as well as the remaining mushrooms & bok choy. Let this cook for approx 3 minutes, stirring in seasoning and curry paste. Add in coconut milk, bring to light boil & then decrease heat and cover for 15 minutes. Taste for flavor & adjust if more curry powder or paste are needed.